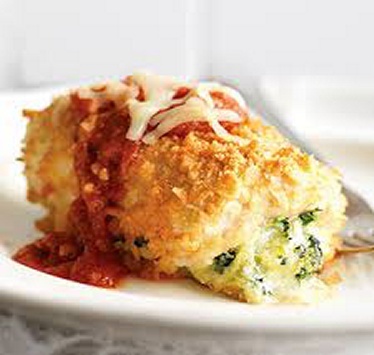 Mix cream cheese product, spinach, 1/2 cup mozzarella and 3 Tbsp. Parmesan until blended. Place chicken, top-sides down, on cutting board; spread with cream cheese mixture. Starting at one short end, tightly roll up each breast. Secure with wooden toothpicks. Whisk egg white and water in pie plate until blended. Mix remaining Parmesan and bread crumbs in separate pie plate. Dip chicken, 1 roll-up at a time, in egg white, then roll in crumb mixture. Place, seam-sides down, in 13x9-inch baking dish sprayed with cooking spray. Bake 30 min. or until done (170ºF); discard toothpicks. Serve chicken with pasta sauce; top with remaining mozzarella.